Through January to April, change is gentle but not unnoticeable. Every visit to the plot brings with it signs of transformation. Leaves appear. Life is increasingly obvious. And sometimes it halts with those fickle and often dramatic fluctuations in the weather. But it is there and mostly it’s felt like a quiet hum of excitement. There is always one day during this month when I walk up to the allotment garden to be hit with a blaze of mixed emotion. It’s like the garden has (stupidly) guzzled back a pack of Red Bull overnight. And mixed emotion is correct. There is the thrill of seeing an abundance of green poking through the soil and even for the early supply of the fruits of our labour. What a treat. But there is also the horror of weeds. This is nature telling us you can’t have it both ways. You want growth? Well, you can have it. Warts and all. The truth is, we should embrace this. Weeds are wondrous as well as frustrating as hell. The important point is accepting that they will grow and to learn how to manage them and make these plants less of a hindrance. Mare’s Tail – A horror story? Not really. In May there is a sudden change in gear on the plot. And I have to take a breath to keep up. The plants I’ve nursed in the pots under glass are now growing to the point of becoming a pain. I tell myself we are almost past the danger of frost and soon the greenhouse can be cleared, plants put out in their beds and with that, the opportunity to sow more undercover ready for the autumn and winter harvests. If you follow me on Twitter and Instagram, you may know I’m embarking on a project with a budget polytunnel. I want to see if a low-priced 16ft polytunnel stands up to the test. 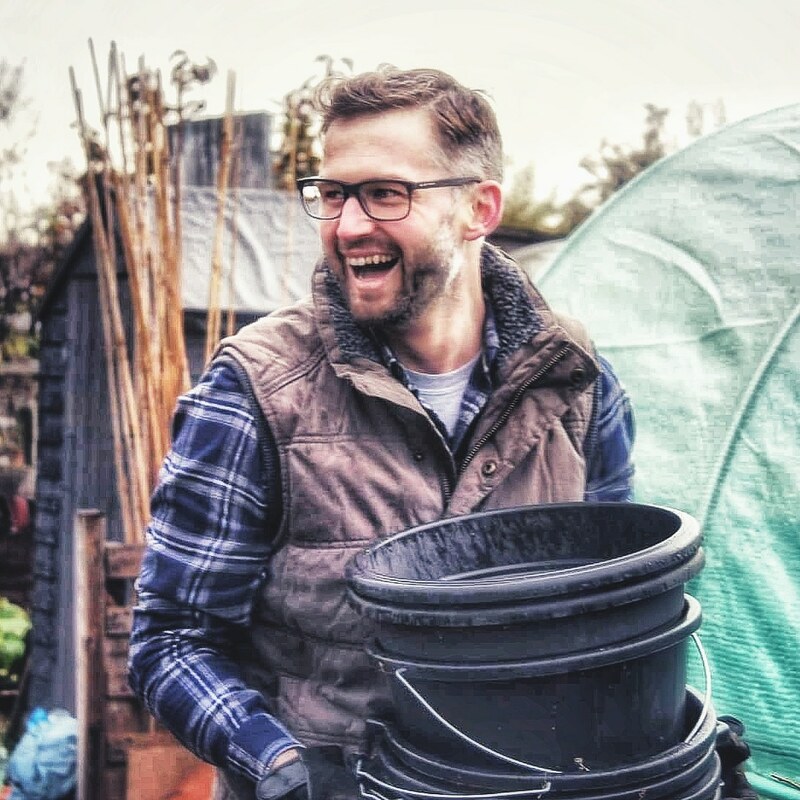 I passionately believe that allotment gardening should be accessible to everyone. A polytunnel is such a wonderful asset as it enables us to grow a wider variety of crops and also allows us to extend the season. And who doesn’t want to make those homegrown veggies last that little bit longer? I’m doing this as I want to find out if it’s a potential option for those who feel left out of the opportunity to own a polytunnel because of the cost. I really want this to be a possibility. I’ll write a full blog about this project as soon as it’s complete. But for the moment, although there’s been a bit of swearing and the odd steal pole hurled across the allotment, I’m cautiously positive about the results. I’ve finally caught up with my monthly sowing and planting task list. The early spring provided us with a roller-coaster of ride weather wise which resulted in germination failures due to freezing temperatures, a wipe-out of seedlings from a heat wave in April and inevitable delays in sowing seeds. But I’m back and just this week I’ve sown French Beans (Mamba), Sweetcorn (Incredible F1), Brussel sprouts (Brodie F1) and autumn cabbage. Enjoy every moment of May. Look at how marvellous your garden is proving to be. Get excited and whatever you do, don’t beat yourself up with the bits you haven’t done or the weeds that are yet to be pulled. Soak it all in. Now, remember what I said about the importance of other people’s stories? Well, let me know yours in the comments below. I think the “May transformation” has been particularly pronounced this year. We have had a lot of sunshine this month, and that is what really makes the difference. I think you are right there Mark. It’s a combination of this lovely sunshine and the comparison to the awful weather in earlier spring. I’ll be very interested to read about your polytunnel experiment as we have such a short growing season in Scotland that any way to extend it would be a worthwhile investment. I absolutely have that feeling, I’m so pleased that things are started, my heart is sinking at the thought of all the watering I’m going to need to do over the next couple of months! I’m looking forward to seeing how your polytunnel experiment goes too! Great post Richard. First of all I’m inspired by people such as yourself to improve my own blog. I’ve recently been trying to ‘write’ more instead of it just being a show and tell by including real content and I think I’m getting there, so thank you for that. May really is a fab month when things, beyond the frosts, do start to come to life. (I’m having a few issues with tender plants such as toms as if you have time to check out my blog you’ll find somewhere about the damage to my Poly House hence they are nowhere near as they should be…) With regard to weeds I suffer in the spaces between my beds and tyres but started on the road to no dig this year which seems to be quite successful – apart from the odd shot of bamboo but don’t get me started on that!! (I tried to add you to my list of fav blogs but I get a mahoosive picture of your good self.) Right, as usual, I’ve rambled on far too long. I’ll keep reading about your progress including the mini poly tunnel. There a few rows of seeds that have done nothing e.g carrots. I think I may have to give up on them and plant some more. A great site Richard & as I start my allotment journey I look forward to reading about your trials & successes on your plot. 15a is my plot. Sounds a bit like Harry Potter I’m thinking & I’m hope to create some magic there. My first viewing is tomorrow at 10. Somewhat anxious about it. The plot is currently managed by a committee member. No pressure there then to succeed.